This is another post showing the versatility of the Weber Jumbo Joe. This is the basic but classic whole roasted chicken. 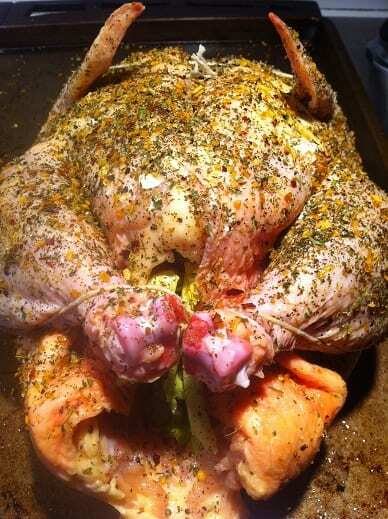 Start with a whole chicken and remove the neck and giblets from the cavity. Rinse the bird, work some butter under the skin covering the breast meat and stuff the cavity with half a lemon, an onion and celery. Pat any excess water from the surface of the bird with paper towels. Give the bird a light coat of oil (I spray with Pam). This helps the rub adhere and promotes browning. 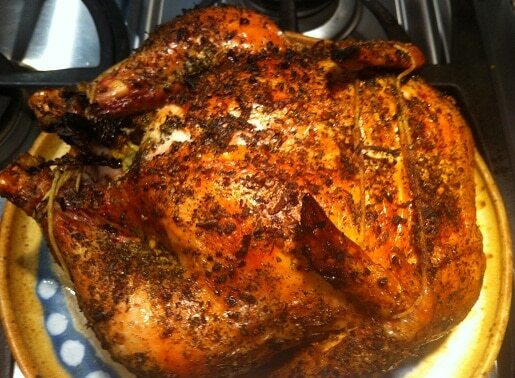 Coat the bird all over with a rub that is very low on sugar. We are going to be cooking this guy at high heat and sugar will burn. I used Zatarain’s Big and Zesty Garlic and Herb. You can go as simple as salt and pepper and this will still turn out great. Use some butcher’s twine and truss the chicken; you don’t want your bird flopping and dangling. Get it tight. 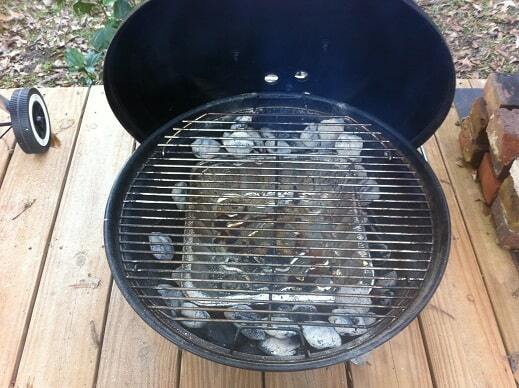 I set up the Weber Jumbo Joe with an aluminum drip pan in the middle of the charcoal grate. I lit a full chimney of charcoal and poured the coals on either side of the pan. 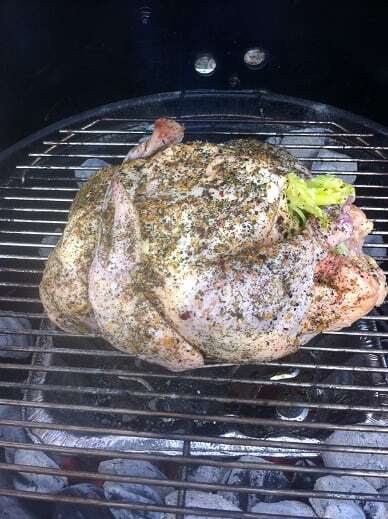 I placed the bird on the grill grate over the pan, opened up the top and bottom vents all the way and closed the lid. The Jumbo Joe got really hot! I am not sure exactly how hot the grill was running as the digital probe I use to measure the dome temperature pegs out at 400F. After 45 minutes I took the lid off to see how the bird was doing. The skin was evenly turning a beautiful brown and the breast was registering 120F. I closed the lid and let the bird roast for another 40 minutes. 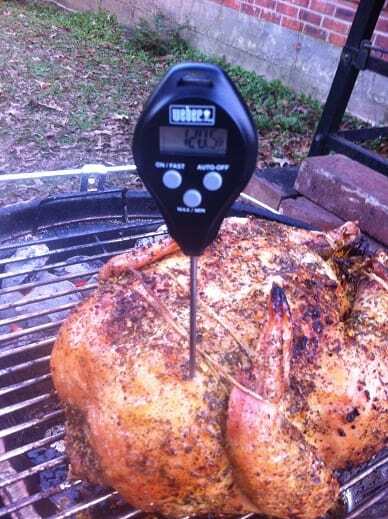 When I checked again the breast was reading 170F and the thigh was at 180F. She was done and she was beautiful. 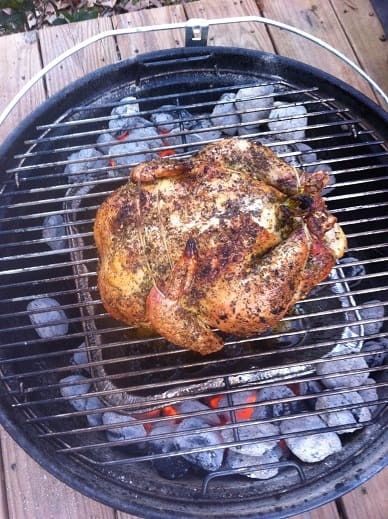 The Weber Jumbo Joe is a chicken roasting machine! I took the bird off the Jumbo Joe and let it rest for 30 minutes before carving. 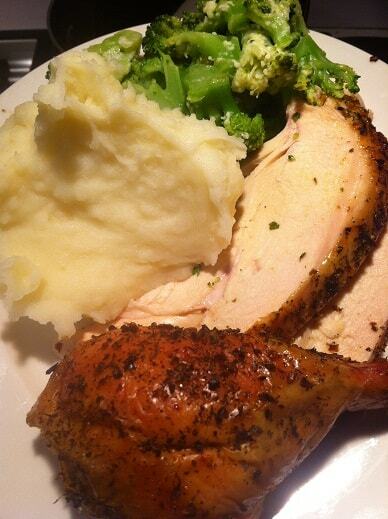 The chicken was served up with some mashed potatoes and broccoli. Good eats! This is a real simple approach to a classic meal. As long as you don’t overcook the bird you don’t need to brine. If you did decide to brine it wouldn’t hurt a bit. The Jumbo Joe is a blast; be sure to check out the full line of extra toys that work on the Jumbo!